The 570GT is intended to offer a more understated package than its siblings, the 540C and 570S. McLaren says that the 570GT is the first supercar it has produced that was not conceived primarily with the racetrack in mind. The reason is that McLaren wants to lure new buyers to the UK brand by offering an elegant, comfortable luxury sports car that provides plenty of power but in a more understated package. "They want the performance but the don't need people looking at them," Geoff Grose, chief engineer for the 570GT and its more radically designed sister models, the 540C and 570S coupes. To separate the 570GT from its siblings McLaren gave it a number of convenience features such as electric eight-way adjustable seats with heating and memory function, concealed pockets within each of door, a central storage area beneath the arm rest and an extra 220 liters of luggage space underneath a glass hatch behind the driver and passenger. Like its sister models, the 570GT also offers a 150-liter front luggage bay. Another way McLaren improved the 570GT's day-to-day usability is by making the front sill narrower and by reducing its height by 80mm. This makes it a lot easier to enter and exit the car. While the 570GT is more cozy than its siblings, McLaren didn't sacrifice on performance. The 570GT’s 3.8-liter twin turbo V-8 gasoline engine powers the supercar from 0 to 100kph in 3.4 seconds and 0 to 200kph in 9.8 seconds. It has a top speed of 328kph. "At the end of the day it has to be a driver's car," Grose said. By comparison the Porsche 911 Turbo S goes 0 to 100kph in 2.9 seconds and 0 to 200kph in 9.9 seconds and has a top speed of 330kph. Production of the 570GT will start at McLaren's factory in Woking, England, this month. Global deliveries start in July. The U.S. is expected to be the 570GT's top sales market, accounting for 40 percent of the vehicle's global volume with Europe, Asia and the Middle East expected to account for about 20 percent each. 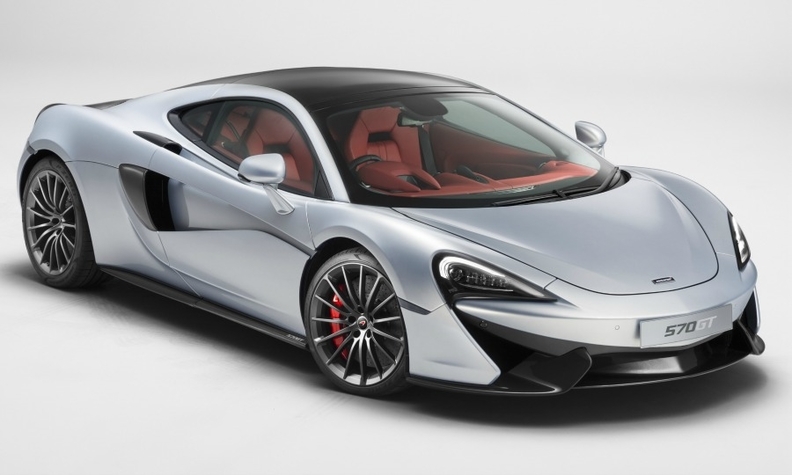 Volume: In 2017, the 570GT is expected to account for about 800 of the 2,000 sales for McLaren’s 3-model Sport Series family, which includes the 570S and 540C. Performance: The 570GT’s 3.8-liter twin turbo V-8 gasoline engine can power the car from 0 to 100kph in 3.4 seconds and 0 to 200kph in 9.8 seconds; while it can go from 0 to 60 mph in 3.3 seconds and 0 to 100 mph in 6.6 seconds. Transmissions: The 7-speed dual-clutch transmission combines mechanicals from Italian gearbox specialist Oerlikon Graziano while McLaren takes care of the layout as well as the electronic control unit. The so-called SSG (Seamless Shift Gearbox) offers three modes: Normal for the most comfortable, smoothest shifts; Sport for faster shifting and reaction to input from the driver; and Track for the quickest shifts and highest level of responsiveness. Weight and dimensions: The 570GT weighs 1,350 kg (2,976 pounds) with lightweight options; the weight distribution is 42 percent front and 58 percent rear. The mid-engine supercar is 4530mm long, 2095mm wide and 1201mm tall.